For more than twenty years we have been in the business of filming for professional live and prerecorded broadcasting for a local television station. We continue to cover on-location and studio shoots from our four broadcast studios in California, Texas and now Alaska. In the 1990s we acquired the personnel and skills to allow us to expand our capabilities to offer high quality video over the Internet. Beginning with the first live Internet broadcast of the Daytona 500 in 1996 we have been leaders in helping our clients take advantage of the many benefits of Internet Video broadcasting. We have been leading the expansion of Internet broadcasting in the region for more than 12 years and we are always staying current with video equipment and trends. We count many commercial and government agencies as satisfied clients. In service to California, Nevada, Alaska and Texas government and commercial customers, we have a wide array of clients who take advantage of our skills and capabilities. We have delivered broadcasts and short form videos including documentaries for more than 200 different California, Texas Alaska and Nevada State agencies. Many of these are based upon multi-year contracts. Some require many broadcasts per client per month or year from a variety of locations throughout the USA. We are proud to be your Video production and webcasting resource. We would enjoy having you and your staff come by and visit with us. We work all week long sometimes late into the evening and on weekends as well, but we can set aside to for a tour and also to understand your event or project requirements better. We can take you through the production areas, sound stage, control rooms, editing rooms and broadcast transmission areas. Broadcast studios are fun and very informative places to visit. 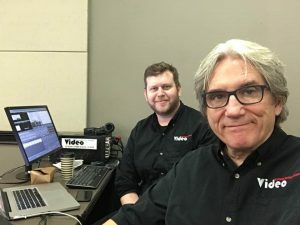 If you are considering a studio shoot or a live broadcast from our studios or anywhere in the United States, it is important that you understand what our sound stage and production facilities can support as much as it is important for us to understand what you want to accomplish with your video production. If you would like to storyboard a short form video, we have the script writers and producers to put together a first class piece for your organization. Give us a call we would be happy to arrange a tour. 40 years’ experience as a high technology engineering executive. Significant experience in high performance computing, Military electronics, IP networks, Security and Video Broadcasting. Business and Technical advisor to the Board of Public Television. BA in mathematics and history Hillsdale College. 15 years’ experience in Internet media and broadcasting. Berkeley School of Music. Experienced expert in Internet video broadcasting, encoding, live switching and audio for video. Jesse comes to VideoSSC from the US Navy. He has years of production experience specializing in government live event broadcasting, Technical direction, video switch live operation, audio engineering and streaming via the Internet. He is particularly skilled at coordinating all of the many moving parts of a live production and our crews associated with them. He has worked live event broadcasts throughout the US for VideoSSC. 15 years’ experience in audio recording and engineering. Recording Engineers Program, Sacramento City College. Conversant in ProTools, Avid Audio, Live Sound and a variety of Audio equipment. 25 years’ experience in video and multimedia production with the United States Air Force. Audio Engineering degree from Consumnes College. Broadcast production truck training, public television Sacramento. 25 years’ experience. Engineer at Apple Computers, Final Cut Pro support, Operations and production Sacramento television station Channel 31, Walla Walla College, School of Media Studies. 25 years’ experience. Global Director of Public Relations and marketing, Day Software. BA in Communications, MA in Communications, National University.Script and storyboard development. Professional live-sound engineer with experience in recording engineering, and live event recording Graduated American River College. Certified in Music Production, Recorded Music, Voice, Foley Sound Effects, MIDI, Pro-Tools.Officer with the regional Audio Engineering Society. April is a certified court reporter in California and Nevada. She has over 20 years of captioning experience specializing in governmental captioning, live Web captioning, and streaming via the Internet. She has worked throughout the United States and Canada as well as Russia in an educational setting. Dawn is an Emmy Award Winning Producer and director. We are delighted that she has become affiliated with the VideoSSC team. She has over many years of live and on-location production experience for Fox Television, NBC Television, and Public Television. She has produced live event as diverse as the Barcelona and South Korean Olympics as well as lead stories and programming from many location in the far east. Sasha is a seasoned veteran of broadcasting. with deep experience in Audio engineering, and a variety of video switching and camera equipment. She has run a variety of gigs for VideoSSC. She also is an independent film maker working on documentaries and other projects. Eric comes to VideoSSC from the world of broadcast television where he spent many years working with producers producing live content using ENG style camera equipment. He is an accomplished shooter, editor and photographer who has produced camera work and complete packages of short form video Public Service Announcements for us. Houston comes to VideoSSC with a degree in broadcast journalism from Tarleton State University, a part of the Texas A&M system. He is responsible for all aspects of our operations in Texas including a strong focus on music videos, live broadcasting of performances, and large venue planning and broadcasting for meetings, rodeos, NASCAR and other events. With experience performing live broadcasts from locations as diverse as Jackson Hole Wyoming and London England, he leads a team of seasoned professionals. We are very fortunate to have an association with “Mr. Soundman”. Some of the venues we work at require audio and lighting that extend our native capabilities. When Lighting trusses are needed, PAR38’s, ETC LEKO’s, or lighting effects, Mark can support the largest stages in California. When Audio support is needed he is there as well with very high quality live sound support for all aspects of live production. Video Streaming Services, LLC has been awarded California State Government contract number 3-07-70-2388A for all of the services listed on this page. This contract is available for use by any state, local, or municipal government agency in California. A copy of the contract can be made available upon request. A summary of this contract is also available here.